Thank you for your interest in Georgia State University! Are you ready for a campus experience in the heart of downtown Atlanta? Are you looking for a research institution equipped with world-renowned faculty and state-of-the-art facilities? Are you hoping to mix and mingle with a diverse group of students from every county in Georgia, every state in the U.S., and over 150 countries worldwide? You found it! 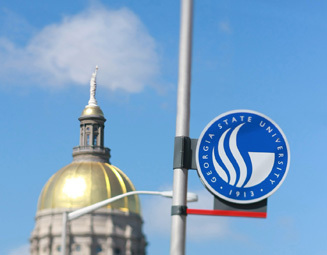 At Georgia State, you can choose from dozens of nationally-ranked fully-accredited programs and more than 200 different majors, minors and degree programs — more than any other school in the state. Georgia State was just named one of the Top 100 Public Universities in the country and #2 in Georgia by Forbes magazine based on student satisfaction, affordability, and the job placement success of our graduates. We hope you will discover what Forbes and thousands of others already know: Georgia State is one of the best academic values in the nation. 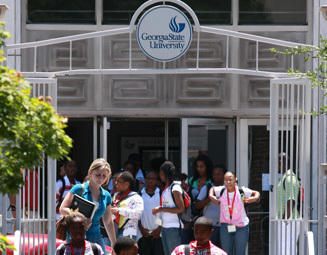 Founded in 1913, Georgia State University is the largest university in the metropolitan area with total enrollment of over 31,000 students, including over 1,500 international students. Georgia State’s highly ranked business school is the sixth largest in the United States, aided in part by our location just minutes away from many of the nation’s top companies, such as Coca-Cola, Turner Broadcasting, Georgia-Pacific, BellSouth, UPS and The Home Depot. Despite its location in the hustle and bustle of a major U.S. city, Georgia State has one of the safest campuses in Georgia, with the largest campus police force in the state. As the governmental, financial, retail, health and legal center of the Southeast, Atlanta supplies abundant sites for internships and real-world learning experiences for Georgia State students. Students find professors approachable, engaging and willing to connect them with relevant research and work opportunities. We are thrilled that Georgia State is part of your college search, and hope you will join this exciting, culturally rich community! The Intensive English Program (IEP) in the Department of Applied Linguistics/ESL is designed to provide non-native English speakers (both residents and international students) with opportunities to develop the language and cultural competence necessary to make their success at an American university an achievable goal. The Intensive English Program offers academic English courses from basic to advanced levels of proficiency. The lowest level is for students who possess a basic knowl­edge of English. The highest level is for students who are almost ready to begin their degree study. 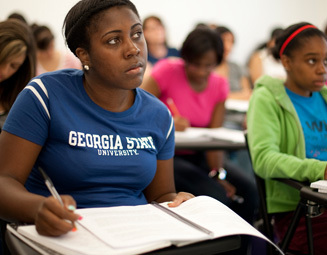 In some cases, students who have been accepted to a degree program at Georgia State may combine upper-level IEP courses and regular academic course work. Every level in the IEP offers five courses each semester (a total of 18 hours in class each week). Courses are designed to prepare you for college and university study in the United States. They include academic writing, oral fluency, structure/composition, academic reading/listening extensive reading/vocabulary, and oral communication. Additional instruction is also available free of charge with our ESL tutors in the Learning Commons of the GSU Library. Classes meet Monday through Friday in the morn­ings and early afternoons. English courses are offered during three sessions each year, following the same calendar as the university. For more information, refer to the website (www.gsu.edu/esl). In addition, the Department of Applied Linguistics & ESL offers academic language support courses for non-native English speaking graduate students enrolled at Georgia State (Academic Listening & Speaking, Academic Writing, and Teaching at the University for International Teaching Assistants). Two courses offered at the undergraduate level are sections of English composition specially designed for bilingual and non-native speakers. For more information, refer to the ESL for Credit Program. Georgia State University’s residence halls are designed to provide you with safe, comfortable campus living that supports your academic success, extracurricular involvement and personal growth. And because our transition to a residential university is fairly recent, our residence halls were designed with the 21st century student in mind. For information on all the on-campus student housing options, please view University Housing’s website. International applicants must meet the regular admission requirements of their student type. If you have never attended college, please see our admission requirements for Freshmen applicants. If you have completed some college coursework and wish to complete your undergraduate degree at Georgia State, please see our admission requirements for Transfer applicants. For all other student types, please see our admissions home page. The staff members of International Student & Scholar Services (ISSS) are thrilled that Georgia State is part of your college search, and look forward to helping answer any immigration questions you may have. After you have been accepted into Georgia State by the appropriate admissions office, international students seeking F-1 visa status will be asked to provide financial documentation by the International Admissions Coordinator in ISSS. Once your financial documents have been approved, a Form I-20 will be processed and sent to you. The Form I-20 is required during the visa interview process with your appropriate U.S. embassy or consulate. If you currently hold F-1 visa status from another school in the U.S. you may transfer that status to Georgia State University after providing appropriate financial documentation. For detailed immigration information please visit the ISSS website at www.gsu.edu/isss. International students on F-1 or J-1 visas pay the out-of-state tuition rate. The cost of a year at Georgia State for all students depends upon the meal plan you select and where you choose to live. The information below indicates the approximate cost of a year at Georgia State for undergraduate international students. Please see the ISSS website for full information on the cost of attendance for international students. 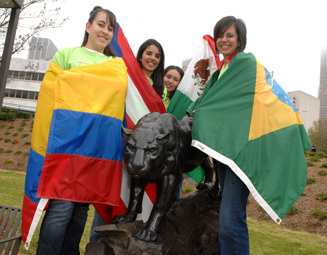 As a public university with low-cost tuition, Georgia State offers only a limited number of scholarships to international students. For undergraduate freshmen, a small number of scholarships are available which allow students to pay only in-state tuition. For more information, see the Office of Scholarships website, specifically the Campus Atlanta Scholarship. International students can also seek part-time work on campus to help with expenses. For graduate students, financial assistance varies by academic program. The majority of international graduate students at Georgia State eventually obtain a graduate assistantship, either during the admissions process or after studying a few semesters on campus. Graduate assistantships are considered part-time on-campus employment (often within the academic department) that provides a full tuition waiver along with stipend. Contact your specific academic department for information on availability of graduate assistantships. Outside the classroom, Georgia State offers students a multitude of ways to get involved: over 200 students clubs, including 20 international student groups and multiple professional organizations, sports opportunities and amazing recreational facilities. Students can enjoy outdoor activities like cycling and horseback riding, and take trips to hike, camp or whitewater raft in the nearby North Georgia mountains. Please see your specific program and college for deadlines and admissions requirements.